Piercing Lipid Bilayers with Peptides (E.E. Ambroggio et al.). Liposomes as a Tool for the Study of the Chronic Actions of Short-lived Peptides in Specific Sites of the Brain (F. Frézard et al.). The Novel Liposome Preparation Methods Based on In-water Drying and Phase Separation: Microencapsulation Vesicle Method and Coacervation Method (Tomoko Nii, Fumiyoshi Ishii). Membrane Adhesion and Domain Formation (T.R. Weikl, R. Lipowsky). Curvature-induced Sorting of Bilayer Membrane Constituents and Formation of Membrane Rafts (V. Kralj-Igliè, P. Veraniè). Pure Lipid Pores in Unmodified Planar Bilayer Lipid Membrane at the Phase Transition from the Liquid Crystalline State to the Gel State (V.F. Antonov et al.). Lipid Vesicles – Development and Applications for Studding Membrane Heterogeneity and Interactions (N. Puff, M.I. Angelova). Basic cell-cell and cell-surface interactions in Liposome and Cellular Systems (U. Gisma et al.). The Biologically Relevant Lipid Mesophases as "Seen" by X-rays (M. Rappolt). 10.SNARE-induced Fusion of Vesicles to a Planar Bilayer (D.J. Woodbury et al.). 11.Elasticity and Electrostatics of Amphiphilic Layers: Current State of the Theory and the Experiment (I. Bivas, Yu. A. Ermakov). 12.Exocytosis: The Pulsing Fusion Pore H.H. Chowdhury et al.). 13.Transmembrane Polarity Profile of Lipid Membranes (Vesna Noethig-Laslo, M. Sentjurc). Volume 5 presents recent research on both planar lipid bilayers and liposomes based on their historic and experimental realization. 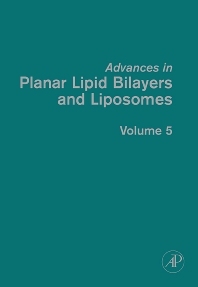 Advances in Planar Lipid Bilayers and Liposomes, Volume 5, continues to include invited chapters on a broad range of topics, covering both main arrangements of the reconstituted system, namely planar lipid bilayers and spherical liposomes. The invited authors present the latest results in this exciting multidisciplinary field of their own research group. Many of the contributors working in both fields over many decades were in close collaboration with the late Prof. H. Ti Tien, the founding editor of this book series. There are also chapters written by some of the younger generation of scientists included in this series. This volume keeps in mind the broader goal with both systems, planar lipid bilayers and spherical liposomes, which is the further development of this interdisciplinary field worldwide.